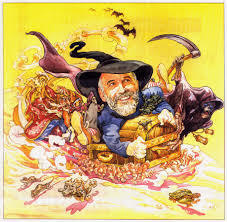 Terry Pratchett is one of my favorite authors. His Discworld series is a satirical reflection of current and historical events and explores social norms, often lampooning other authors and sacred institutions. No one is safe from his wit, and through him we society as it really is. Silly and sometimes rather pointless. Like Shakespeare, Pratchett shows us what it means to be human and how our folly is the cause of many of our problems. The genius of Pratchett is that the mirror he holds in front of us is a fun-house mirror in which distorted truths lead to enlightening insight. To honor his birthday, April 28th, I thought I’d share a few examples of his genius. By looking closely at his world we can learn a lot about ourselves. 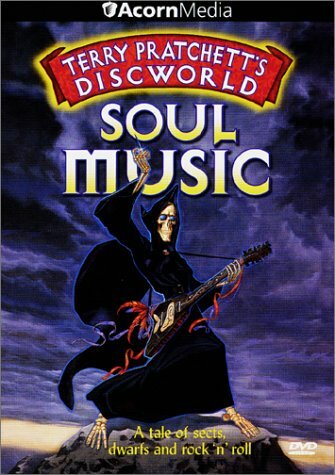 The Discworld is a flat disc, with oceans that drop down on all sides in huge waterfalls. 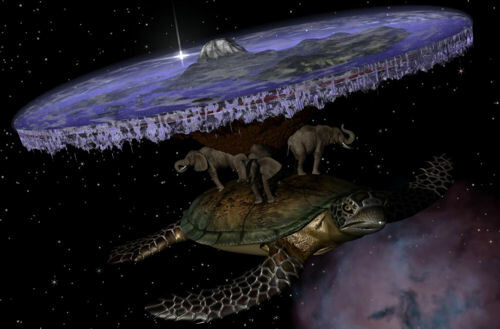 The disc held up by four giant elephants who in turn, stand on a turtle named Great A’Tuin,(“ world turtles” are common to many cosmologies) as it slowly swims through space. It is said Great A’Tuin swims through space looking for a mate, but it would be hard to image what it would do once it found one, given that is has four elephants on its back. Here we see right away, Pratchett is making fun of the medieval idea of a flat earth that traveled too far will lead to certain death. Religion plays a major role in all of the books the idea of a great turtle is no exception. The silliness of a world floating through space with the aid of giant animals is no sillier than the stories we find in all religions. There are four main continents on the Disc .The majority of the Disc’s landmass is composed of a single supercontinent and a smaller Counterweight Continent connected by a narrow peninsula. 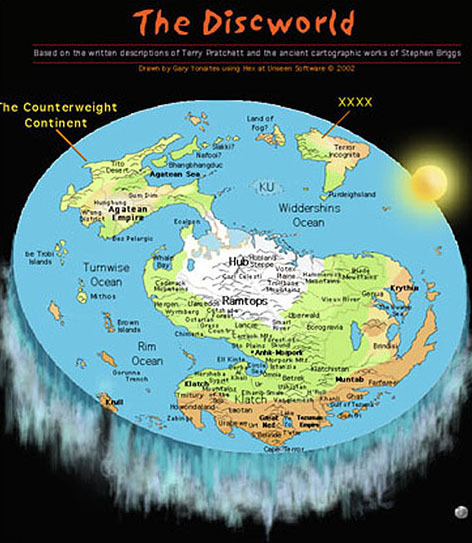 The main unnamed supercontinent is where most of the novels are set (Think Europe) with the smaller continent being Klatch, (think Africa), The island continent of Fourecks (A.K.A. Terror Incognitia) is the smallest of the four (think Australia). On these continents a large number of countries, kingdoms, cities and towns can be found; the most widely mentioned in the books being Ankh-Morpork, Lancre, the Klatchian Empire and Überwald. It is in these settings that social commentary is front and center. There are wars between nations and in times of peace distrust is the motivating driver of several books. Ankh-Morpork, the main setting for the series, resembles Victorian London complete with a river no one dares enter. The river is so polluted that it is often described as barely qualifying as a liquid. In Pratchett’s second Disc World book we get the best quote about the city. Ankh-Morpork! Pearl of cities! This is not a completely accurate description, of course — it was not round and shiny — but even its worst enemies would agree that if you had to liken Ankh-Morpork to anything, then it might as well be a piece of rubbish covered with the diseased secretions of a dying mollusk. The air is so polluted birds cough rather than sing. The streets are narrow and dirty. Houses are so close together it is sometimes difficult to know where one starts and another begins. As much as the people grumble about the conditions of Ankh-Morpork there is nowhere more exciting and more appealing. The city is crammed because it is a siren call to the inhabitants of the Disc World. Just like London the city is the cultural center of this small world. Readers of Dickens would instantly recognize this city. It is where we see the worst of humanity (with its cut throats and bands of villains) and the best of humanity ( the City Watch is made up of characters who on one hand want to keep the citizens safe, but are more likely to walk away from a fight than engage in one). Pratchett gives us a place in which anything can happen and often does. It is here we see humanity struggle for survival while showing us just how important community is. The times are a mix of medieval (complete with wizards, witches trolls, dwarves, and golems) and Victorian. In this world vampires clash with witches, trolls and dwarves make up the body of the police force. Zombies show up from time to time as do werewolves and dragons. Each of these characters are usually more human than the people they encounter or work with. Pratchett uses these characters as devices to illustrate our hidden prejudices and fear of “others”. 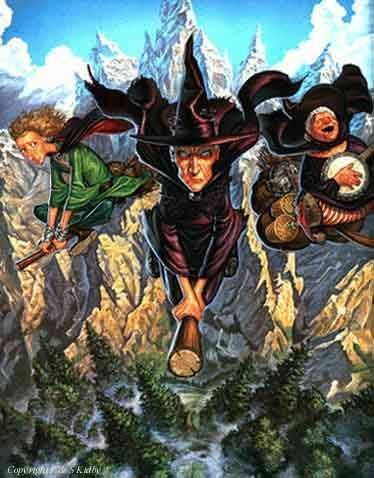 I cannot honestly think of a series that has more hilarious yet very human characters than Pratchett’s. Listing them all would require an additional post. I’ve picked my favorites, ones that illustrate what it means to be human. 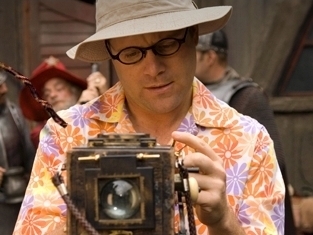 Twoflower first appears in The Colour of Magic .He is the Discworld’s first tourist. He strolls around the city of Ankh-Morpork looking for adventure and genuine native food, and taking pictures of everything with his iconograph. As one of the most naïve people on the disc, he truly thinks no harm can come to him. This is a man who wants to see everything but experience nothing. Because he does not become involved he avoids injury. He represents the western attitude that does not allow for real connections. His idea of engaging in the world is to photograph it, to capture it for later reflection. While some may view his non-involvement as a sort of Buddhist ideal of non-attachment, a deeper meaning can be found in his obsession with pictures. Even as he stands in the middle of the action, he doesn’t really see what is in front of him. His idea of the world and how it should be gives shape to his perception. He sees what he wants to see and ignores the rest. It has been suggested that if Death could cure world hunger, he wouldn’t do it by making social and economic changes he’d simply give everyone a hot meal. Death is a favorite not only because we instantly connect with him, but because it is Pratchett’s satirical view on life that we hear through Death. Death is at once the straight man and comic relief. My favorite quote comes in a scene (for the life of me I cannot remember which book) that has a man up a tree as hungry wolves jump around him. The man fearing his life may soon be over looks up and sees Death sitting on a branch. The man asks, “Are you here to help me? Death answers, “YES, BUT NOT IN THE WAY YOU HAD HOPED”. Many of the stories in the series center around a mystery. Something terrible has happened or is about to happen and it is up to Pratchett’s colorful characters to solve the crime. In other books Pratchett makes fun of current events by setting them in medieval or Victorian times. You never quite know what you will get when you pick up a Disworld novel. But isn’t this just like life? Previous Previous post: If it Wasn’t for Shakespeare…Lists!